You won't believe the colors you can see with the new Samsung Galaxy Tab S, which Samsung unveiled in New York City last night. Colors on the Tab S, Samsung's new flagship tablet, are obviously noticeably deeper, brighter and crisper than on an iPad or even Samsung's own former flagship Galaxy Note Tab tablet. But the best news about the new two-model Tab S series are the prices: just $499 for the 16 GB 10.5-inch version, $399 for the 16 GB 8.4-inch version. Maybe these price tags aren't bargain basement, but they compare favorably with Apple's iPad ware than in the past, and offer some decidedly higher-value viewing advantages. 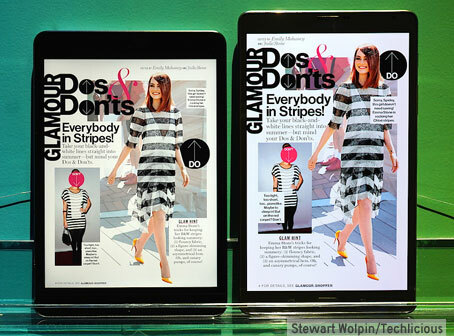 The Tab S' brilliant color display is achieved thanks to its Super AMOLED screen rather than the usual LCD. AMOLED displays have long been known to produce not only a brighter, deeper colors but better stand-up to sunlight (although, from past smartphone comparative experience, I've not been overly impressed with AMOLED's sunlight reflecting capabilities vs. traditional LCD) and are less power hungry; Samsung claims you'll be able to watch 11 hours-plus of 1080p video on the Tab S on a single charge. Images and video are also startlingly sharper on the Tab S thanks to their 4K 2560 x 1600 displays; iPad's Retina 2048 x 1536 screen (although, quite honestly, I'm not sure if Samsung wasn't using the original non-Retina iPad Mini for comparative purposes). Adding to the Tab S image/video viewing experience is its adaptive brightness; its sensors sense and adjust white balance to provide just the right amount of brightness depending on not only ambient light – fluorescent, home reading lamp or outdoor sunlight, but to your activity – reading, watching a movie, viewing images, game playing, etc. Unfortunately, there was no sunlight or other variable lighting conditions available to ambiently tax the Tabs. Samsung also uses a wider 16:10 aspect ratio (your HDTV has a 16:9 width v. height ratio) vs. the 4:3 aspect ratio on iPad. As a result, images and especially widescreen video on the 8.4-inch and 10.5-inch Tab Ss look far larger than you'd expect compared to the 7.9-inch iPad Mini and 9.7-inch iPads, which have to letterbox movies. Both Samsung Galaxy Tab S models are 6.6mm thin. 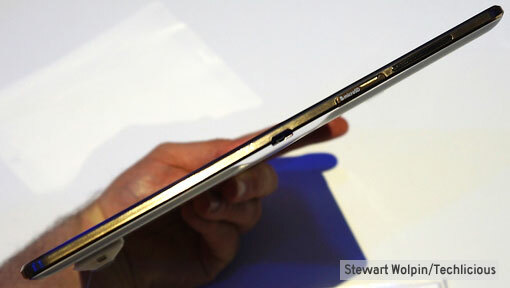 Both the new Tab Ss are also thinner and lighter than their Apple competitors, despite having larger viewing area. Both the Tab Ss are 6.6mm thin compared to the 7.5mm thickness of both iPads; the 10.5-inch Tab S weighs in at 465 grams vs. the smaller iPad Air's 469 grams, while the 8.4-inch Tab S tilts the scales at 294 grams vs. the smaller iPad Mini at 331 grams. Aside from advancing the tablet display and thickness state-of-the-art, Samsung is pushing its Paper Garden magazine app. The company unveiled partnerships with Condé Nast (Vogue, Glamour, Vanity Fair, GQ), National Geographic and – geek alert – Marvel Comics, each with specially-designed and some exclusive content. The Tab S will come with a pile of free short-term and trial music, video and reading subscriptions, including a copy of the movie Gravity. Samsung also demonstrated a new Content Home widget, which aggregates all your sound and image content sources into single home page. You'll also be able to use your Tab S in conjunction with your Galaxy S phone to transfer or make WiFi phone calls or for "mirroring" – seeing the content from your phone on the Tab S screen. Samsung also has ported several features from its pro Galaxy Note tablet series including multi-window for side-by-side app viewing. Technically, the Tab S seems extra speedy when compared side-by-side with its earlier Note tablets. 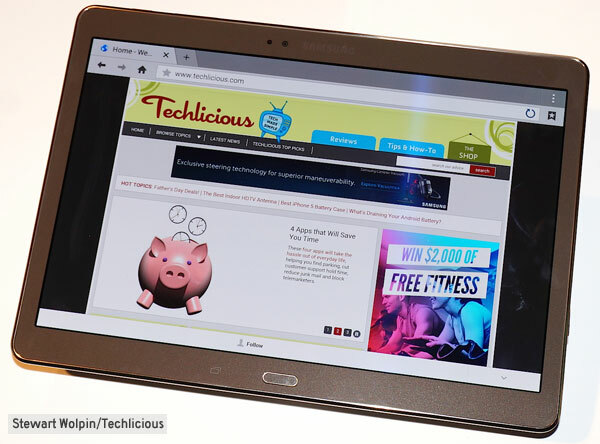 The Tab S brains are "octacore" engines – a 1.9 GHz quad core processor paired with a 1.3 GHz quad core processor, and apps swim in a generous 3 GB of memory. The Tabs will come in 16 GB and 32 GB varieties – no prices for the 32 GB versions were announced. Each can be expanded by 128 GB via a microSD card slot. Each will be available in bronze of white, each sharing the dimpled rear cosmetics of Samsung's Galaxy S5 phones, and ringed in gold. Also available will be two types of cases, a simple flap-over or a "book" case that offers three angles for writing or viewing. There's also be a 7.5mm thin Bluetooth keyboard designed for each. The Tab S goes on pre-sale today on Samsung.com and Amazon: $399.99 for the 8.4-inch model, $499.99 for the 10.5-inch model. WiFi versions will be available in July; LTE editions will go on sale later this year. 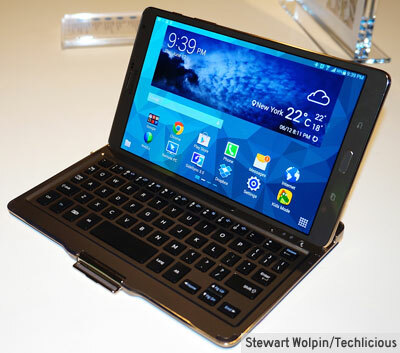 In your posting “Hands On with the Samsung Galaxy Tab S by Stewart Wolpin on June 13, 2014”, you mention that the bluetooth keyboard cover was available for both the 8.4” and 10.5” tablets. The picture showed what looked like an 8.4 with a keyboard. I have not been able to find a sumsung keyboard cover for my new 8.4. Do they exist and can you advise who supply them? Apparently, Samsung has reneged on this initial intention. We contacted the company, and a spokesperson told us Samsung makes a Bluetooth keyboard case only for the 10.5-inch model. The spokesperson did say there were third party Bluetooth keyboard covers for your 8.4-inch tablet available on Amazon, and, we assume, from other retailers as well.